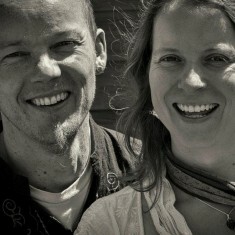 Narayani and Mat Baker are a husband and wife team share a love and passion for devotional music, kirtan and the power of sound. They travel throughout the UK and Europe offering their music and voice workshops wherever they are invited. Narayani is known for her powerful devotional singing and for facilitating voicework that opens the heart and encourages our highest expression. Over the last 10 years, her journey of yoga led her to discover her own resonant voice. Leading her first Kirtan had such a profound and transformative impact on her life that she chose to offer that same gift to others through Kirtan and voice workshops around the world. Narayani studied voice work with Chloe Goodchild and the Naked Voice and has learnt yoga and trained as a teacher in the lineage of Krishnamacharya and the Sivananda Yoga Vedanta Centres. Mat is a singer and multi-instrumentalist. He brings a gentle, transformational quality with his soulful voice and powerful percussion and Bouzouki (Mandolin family) playing. His passion for devotional music began in his childhood in South Africa. His discovered Bhakti Yoga and Kirtan on meeting his wife, Narayani and it quickly became a very natural and integral part of his life and music. Mat also performs solo, singing devotional folk with his Bouzouki, as well as collaborating with a variety of inspirational World & Devotional musicians. Mat has studied with a number of master percussion teachers including Glen Velez and Reinhard Flatischler.